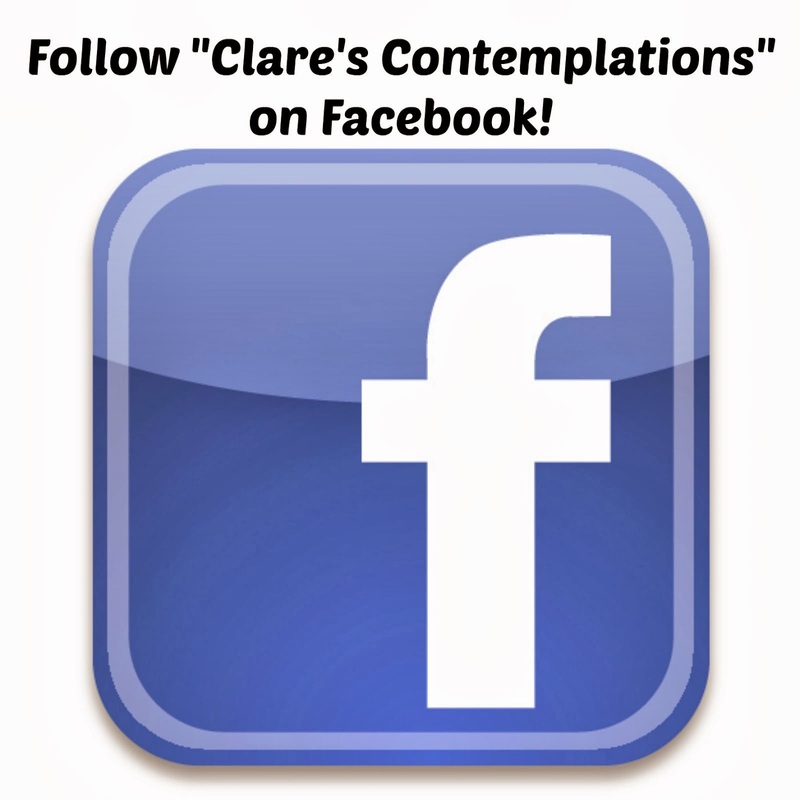 Clare's Contemplations: PPP Day 4: Start Small! Pinterest is both a boon and a bane to party planners (and really, anyone with aspirations for cooking, cleaning, fitness, fashion or DIY of any type!). It is a tool, and this isn't the last time I will say that in this series. 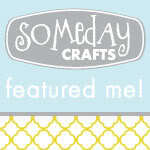 I think we want to vilify Pinterest, but it is really just a big 'ol aspirations list! People who pin things are admiring them-no one says that is the standard we are all to be held to. So, in that light, I have two words for you when it comes to party planning: START SMALL. I say that I got my start in party planning back with that first shower, but that isn't the truth. My mom is a "celebrator"- she always made even the littlest of holidays seem fun. I remember having a party for my brother when he learned how to pronounce his "R" sound-complete with "R" themed food and decorations. That was looong before the advent of Pinterest, or even really the internet! My mom is so great at making people feel special, and she would swear she isn't a party planner-but she is. Because you see, celebrations don't have to be enormous to be amazing. I realized today that I didn't categorize this New Year's Eve get-together as a "party". In my mind, I didn't spend hours on the decorations, or food, I didn't plan any games or activities. I had some of those things in mind (I even have a New Year's Eve Pinterest board!) but in the end, I just wanted it to be easy. So I spent about an hour putting together printables, I stuffed a pinata, and I put together some easy food. And I was happy. And the kids were happy. And our friends were happy. And it was a party! Parties have a few simple elements: food, decorations, and a cause for celebration. Often, I like to include party favors and games/activities. 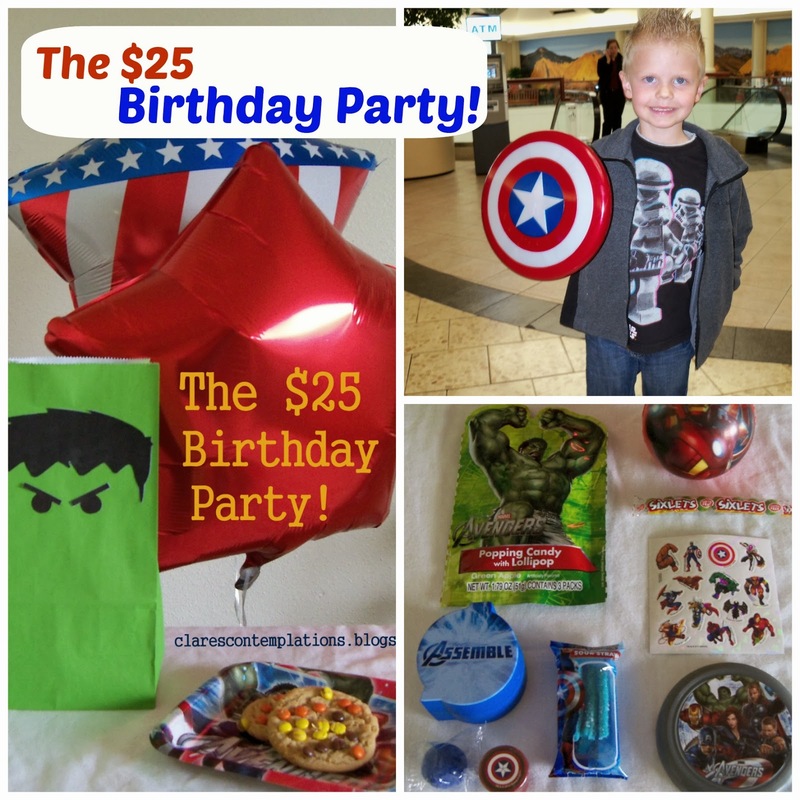 One of my favorite parties, just because it was so different, was this "$25 Birthday Party". That's it! I literally invested about three hours of time and the rewards were huge. 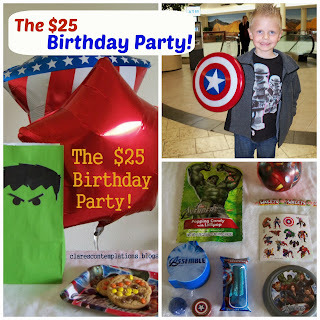 My son was thrilled with his "Avengers" party. His friends came, they had a good time. And it was simple. And stress-free. And fun! If you are just starting to venture into party planning, start out with something easy. First, it will make later, larger successes even more satisfying, and second, you won't be burned out after your first party! "Practice" with a little party if you know that there will be a big one coming up. Perhaps you could pick a small event, not a birthday or shower, but rather something you don't "have" to celebrate. Perhaps a Columbus Day gathering? ;) How about "family-only" party for a small achievement like a soccer win, or good grades, or maybe just a time to celebrate that fall is here! I see apple cider and pumpkin bread with a few little decorations of autumn leaves... Maybe I should have a little party! -A "Mustache Bash" (you could definitely go with fewer decorations!) I did a bachelorette party, but this theme is so trendy right now, it would also work for a birthday party or baby shower. - Another simple birthday party, for my daughter at the Cheesecake Factory. I didn't have to have any decor other than balloons and the activities did double duty as favors. I bought the craft kits and since we had it at a restaurant, I didn't have to make any food. It was win-win and EASY! This one was so easy it didn't make it onto my party planning page! This is Day 4 of "31 Days of Perfect Party Planning". Find all the rest of the days here. Love that you reminded us to celebrate the "small things":) I think starting small is the key to success with any endeavor, but especially with party planning!